For tiling that looks perfect year in, year out, for years to come, No More Ply Tile Backer Board is your perfect partner. Easily get around the dangers of visible and underlying damage that can sometimes come along with tiling. Don’t even think about using problematic substrates such as plasterboard, MDF, chipboard, hardboard and of course, plywood. Using No More Ply Tile Backer Board, you can get rid of all the tiling risks that have plagued even the most skilled of craftsmen for many years. No more loose tiles. No more stained grout. No more rotten substrates. Just super-efficient tiles that stand the test of time, even in the toughest and most extreme of scenarios. Why Did We Use Plywood? It was the most common and convenient method and the way we all did it. Plywood was used for over boarding floorboards before laying or fixing ceramic tiles. It has never been without its faults, though. If the grouting cracked or the sealant failed, water could easily come along, creep in and rot the plywood. This problem has seen many once beautiful designs rendered impaired and sometimes unsightly. There have also been plenty of instances of fungal growth. It has often reacted badly with the adhesive, causing tiles to become loose and ultimately unsafe. There’s also the fact that a minimum of 15mm plywood has to be used for over boarding floorboards. Such a height can create a dangerous step into a tiled room. Of course, many of the pros amongst us recognised this a while back and have been actively seeking an alternative. We thought we’d solved it with the use of marine grade plywood. As we’d soon unfortunately learn, the preservatives used in the material migrated through the grout and gave it an orange stain. The specially manufactured cement based board gives the ideal surface to lay your tiles. 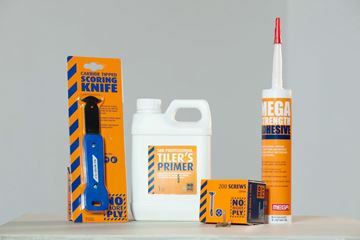 Simply use it in place of traditional over boarding materials, such as plywood and plasterboard, and you’ll be installing with an incredible range of benefits. Here at Tile Town, we are delighted to be able to provide Tilemaster Tile Backer Board as an official stockist. Don’t worry about those pesky problems that used to always have to be in the back of the mind with tiles. Effortlessly lay long-lasting, durable under boarding and you’ll have a floor that remains the envy of almost everybody for years to come.